QUALITY 100% COTTON MUSLIN SWADDLE BLANKETS - lightweight, soft and breathable to baby skin. Helps air circulate around the baby's body and prevent over heating. This is because we only use open weave, light-weight cotton fabric that breathes amazingly well. PROMOTES SECURITY & COMFORT for sound baby sleep and happy mood. Soft to touch helps baby's sensitive skin to feel relaxed and comfortable and allowing them to sleep more easily and longer. 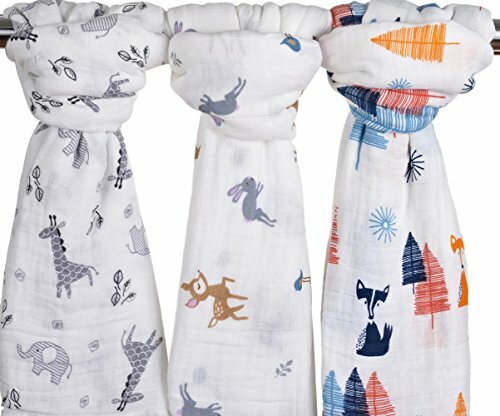 DURABLE and LONG LASTING MUSLIN SWADDLE MATERIAL - gets softer with each wash. Baby's skin is delicate and soft, and they will enjoy the comfort of our products' allergen-free 100% cotton design. Our customers choose muslin blankets as comparable alternative to Aden and Anais. USES COMBED YARN FOR BABY BLANKET - finer fiber that is smoother and stronger (as compared with carded yarn). It is more regular and expensive than carded yarn. Do note that the combing process creates a smoother, stronger, and more compact yarn that is excellent for weaving. Combed yarn is more costly than carded yarn because the combing process is extremely time-intensive.